The bandstand in Triangle Park was dedicated on a Wednesday evening, June 19. 1939. There was a special program for it which included a joint school band concert and numerous speeches. The bandstand is a made of a concrete slab with wrought iron railing surrounding it. It sits to one edge of the nicely landscaped park. The park land was donated to the village by the Lindsay family. 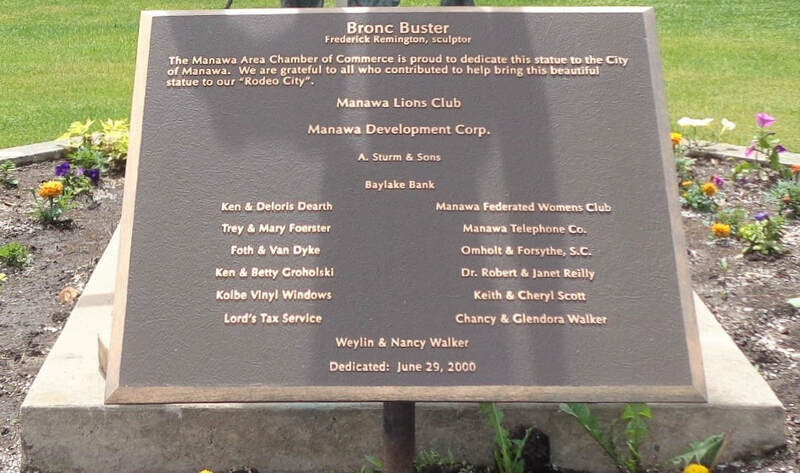 A large sign opposite it cites the many outstanding Manawa community leaders. Currently the bandstand hosts many outdoor concerts during the summer, and it is has been used for the high school homecoming ceremony every year. In the park is a replica of a Frank Remington's 1985 sculpture "Bronc Buster" which was placed in the park on June 29, 2000. Also, the Melvin O. Handich Congressional Medal of Honor Recipient Memorial is located in the park.